On January 26, 2007, the government of Goa withdrew its newest blueprint for the development of the state, called the Regional Plan 2011. Chief minister Pratapsingh Rane said the move was made "respecting the people's sentiments", indirectly admitting the government had bowed to popular outcry against the plan. Investigating the process that led to this backtracking, and analysing its implications, indrajit bose finds an imperative has morphed into a dilemma. Goa must grow. Is there a way out of the development impasse? The official blueprint Goa currently follows is the Regional Plan 2001. It was notified in 1986, and today there is unanimity that this plan has become redundant. For two compelling reasons--both related to conserving the state's natural beauty, but with major implications for land use. First, the Coastal Regulation Zone notification of 1991 restricts development within 500 metres of coastal land as well as land along rivers, estuaries, bays and creeks (wherever tidal effects are left). In effect, says the state government, over 7,000 hectares (ha)--less than 2 per cent of the state's land area but its most valued real estate--is prohibited, or restricted. Then, in the 1990s, the Supreme Court directed even private lands be brought under the ambit of forest regulations. And, according to the Forest Survey of India, roughly 60 per cent of the state's area is forested. Work on a new plan began in 1997.It wasn't merely a question of accounting for the two regulations the face of Goa's economy was changing, with tourism poised to grow and an upsurge in the real estate market. When it was notified nine years later, people cried foul, saying consultations were not held. Or, if held, incorporated changes suiting big business and real estate sharks. People alleged foul play and massive corruption in land deals, which would ravage the blue-green state and destroy the 'goose that lays the golden egg'--the tourism industry built on Goa's natural beauty. 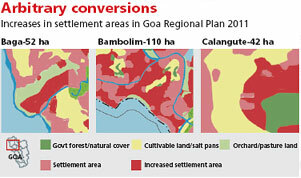 The Revised Regional Plan Goa Perspective 2011, final draft report, is dated September 2003. It was outsourced by the state to Consulting Engineering Services (ces) Pvt Ltd, with headquarters in Delhi. The government says it was deliberated upon in meetings and seminars, before the Town and Country Planning Department--the state's nodal agency--considered it, and the cabinet approved it. In its affidavit to the High Court--where a case is being heard on the matter--the government has stated the draft regional plan was open to the public for comments for two months, which was extended by three weeks "though this three week period was neither required by statute nor under the law but only so the views of the public could be considered". Only then was the final plan notified, on August 10, 2006. Goa Bachao Abhiyan activists allege that the plan has been successively and deliberately changed to increase the area classified as urban. Between the existing plan (2001) and the draft plan (2011), they allege, the area has increased from 29,297 ha--which was classified as settlement--to 36,994 ha by the time of the draft plan 2011 and to 45,000 ha by the time the plan was notified. Goa's total geographic area is 370,200 ha, which means that area under settlement has been increased from 8 per cent to 13 per cent of the land. To make their point clearly, citizens resisting the plan have prepared detailed maps of existing areas (see maps Arbitrary conversions) showing conversions in the surface utilisation map the government issued. The latter was done "without any consultation with local communities and without their consent", according to a petition filed in the Panaji bench of the Mumbai High Court by Goa Heritage Action Group--a registered association of people concerned with Goa's natural and built architecture--and its office bearers, Dean D'Cruz and Heta Pandit. 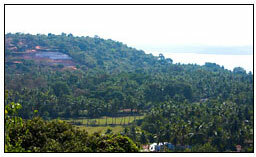 Nauxi is a small village, close to the capital city of Panaji. People here are angry. They say the hill adjoining their homes is being flattened. A builder has acquired the land and is constructing holiday homes, whose buyers are rumoured to be the most glamorous faces of the country. How did the builder get the land? It gets murky hereafter, but it seems names of tenants were deleted in the survey records. Powerful landlords and the local administration have apparently connived. But clearly, villagers were not consulted. In a related case, a resident of village Orda in Candolim woke to find his house on fire. 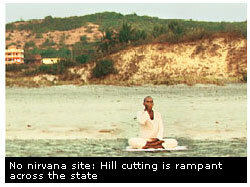 The miscreants were suspected to be those behind the cutting of hills around. The resident was targeted because he was fighting against this devastation. Again a land deal is signed by a hotel company to buy 100 ha of rich forest at Tanxi-Loliem, reports the daily Herald. Some portions belongs to the comunidade of Loliem or is forest land. Nobody knows. But local people who sold their land reportedly made big money. The paper quotes one young seller, "many people who sold their ancestral property ages ago and settled abroad are now telling us--when they visit on vacation--that we should protect Goa." But how was forest land acquired? The forest department, the paper says, is mum. Such stories are legion. Over years, laws have changed to protect the environment; the economy has changed to utilise it. Loopholes in law and lack of clarity in what is allowed, or not, allow blatant misuse and illegality. All land is available to the highest bidder community-owned, private land and even church land. In short, Goa is under the hammer (see box The Claremont mystery). The fact is Goa is extraordinarily beautiful only due to its ecology. It is bordered by beaches on one side, forests on the other. The middle is lush--orchards and rice fields. Village and town settlements flow into this landscape. The beauty exists because regulations conserve it; developers now consider these regulations the state's bane. Coastal regulations Goa has a 105-km-long coastline dotted with mangrove swamps, rocky inter-tidal stretches, estuaries and sandy beaches. Prized land. Real estate companies advertise that they will provide an "exclusive" beach. Laws restrict development; they maintain some traditional rights of fishermen and keep the coastline for common (not exclusive) use. The current game plan is to weaken the laws that protect the coastline against development, and restrict rights of traditional owners--fishermen or toddy tappers--from using this paradise. The crz Notification of 1991, which prohibits, restricts and regulates activities within 500 metres of the high tide line, requires governments to demarcate the high and low tide line across the coast. In 1996, the Supreme Court, in a case on the non-implementation of the crz notification, directed all coastal state governments to prepare coastal zone management plans within three months. These hurriedly prepared 'plans' were approved by the Union ministry of environment and forests (moef) in September 1996. The work to demarcate the crz area across the country was given to seven different agencies. It is still on. Each state must set up a Coastal Zone management Authority, responsible for enforcement and monitoring violations. Different levels of protection exist for different categories of the zone (see box Coasting on unclarity). Enormous challenge The management challenge is enormous. It requires governments to demarcate the high tide line and the different zones and then administer the zones based on different realities as exist across the country. There are also ambiguities--what is a developed area or a substantially developed area? Where is a road already proposed, but not built, where existing structures are allowed to build more, but what was the existing already? The notification rests on demarcating the high tide zone but this is where science suffers policy. According to the 2005 report of the M S Swaminathan committee, set up to review the crz notification, the definition of high tide line has led to confusion among different agencies authorised to draw this boundary. Each agency uses a different methodology for demarcation, leading to variations in the lines that define a zone. There is no clarity regarding the scale of demarcation; most high tide maps, being classified, are not accessible. All this means a case made in heaven for violators. On paper, nothing is allowed; in practice, everything is permitted. So Goa buzzes with rumours about crz violations by high profile hotels. The global chain Marriott is often indicted, not only because it has the most spectacular cocktail lounge views in the state (see boxThe Marriott's sea lounge), but because crz rules confound even its most ardent supporters. It is not clear what the legalities of this and many other cases are. But in the absence of meticulous conditions allowing development, and no credible public processes to oversee such growth, the perception is that the powerful get away. This makes enforcement difficult and even more contested. For instance, crz regulations allow for restricted development of traditional dwellings even in the crz-II zone, earmarked for rural and traditional use. On the one hand, this boosts local level corruption, via permissions for repair, renovation and additions to existing structures. Residents point to entire hotels coming up in the name of "renovation". Worse, it is fuelling a take-over of traditional land. The logic of the up-to-200 metre no development zone in rural areas-- crz-ii--was to provide space for fishermen to berth their boats, dry fish and mend nets. This protected their rights. In the remaining zone, development was to facilitate their settlements and their livelihoods. But now, this is where real estate, hotels and resorts find the loophole of a lifetime. Large areas are purportedly acquired by developers, then turned into five-star resorts. Gradually, the traditional users find themselves marginalised and excluded, even from the use of their own common beach land. Goa newspapers discuss how beaches are being 'privatised'--by strong arm tactics, where locals are simply told off. crz violations include privately owned holiday homes, resorts and unauthorised extensions to homes of local residents. When revealed in mid-2006, the deputy minister said publicly, "the government is very serious and will punish the violators". Little is reported since then. In 1996, the state cleared its coastal zone management plan with the moef. This plan identifies the settlement areas as they existed then. But the areas were never demarcated on maps and never made public.In the Regional Plan 2011, the settlement area has been increased, effectively changing, alleges the Goa Bachao Abhiyan , the zoning of the crz areas, bringing more area from crz iii to crz ii from 'traditional use' and 'no development' to 'settlement area'. Goa's ecology is not just beaches, but also its tidal rivers, mangroves and marshes. This land is even more difficult to demarcate as it is not land but water and requires careful zoning. In the regional plan, say activists, development has been permitted in such ecologically sensitive areas. In its defense, government says the plan is indicative and if any land is classified under crz, it will not be developed. Goa's developers also dislike forest regulations. Goa is doubly blessed with forests. Roughly 62 per cent of its geographical area is covered with forest and tree cover. But crucially, only 33 per cent of this is recorded forest area, that is, under forest department control. The rest--roughly 210,000 ha--is forest land but not under government control. This land is not under the jurisdiction of the Forest Conservation Act of 1980, but its use is guided by Supreme Court fiat. In the mid-1990s, the court re-defined the area under forests, as defined under the dictionary, as 'land under trees'. Such land, though outside the forest department's reach, then came under the ambit of conservation regulations. The issue becomes tricky as a result. Project clearances require government to determine what land is 'forested' and what is not. The state government set up a committee, headed by S M Sawant, to do that. But till date, according to forest department officials, only 15 per cent of the survey work is completed. Government says the work will be completed soon. What is baffling is that the state does not even have records of area leased for mining--a key economic activity in its forests. It only says that "mines in Goa, in most cases, are covered under forest lands". Again, a complete lack of clarity about land use. Again, a case made in heaven for violators. This has led to a rush of "illegal" and "disputed" projects on forest lands. Developers convince people to cut and hand over the land under trees, to cut down hills that have trees or burn the trees, so that there are no forests ergo, no dispute. The regional plan has included forested areas--evident from satellite imagery or existing land use maps--for settlements. Government says it did this because, during plan finalisation, the forest department could not give maps indicating the area earmarked as private forest. It could only give maps of wildlife sanctuaries and forest cover, saying work on a consolidated forest map of the state--including private and public forests--was under preparation. The state in its affidavit to court says "it was not possible to await the final report of demarcation as it would severely affect the expedition of the finalisation of the regional plan". It also refused to take cognisance of the satellite maps showing forest cover. As a result, the land use of existing forested land can be changed with a stroke of a pen. It is literally up for grabs. Many would argue Goa remains caught in a time-warp. Nothing explains this better than the comunidade system. A traditional system of village administration, it was adopted under Portuguese rule. Some say this system began when Saraswat Brahmins migrated to Goa in the 5th century. The Portuguese codified all the laws affecting village communities into the Codigo Das Comunidades. Environmentalists like Claude Alvares explain the importance of this system for the land-use pattern of the state. Under this system, all village land resided in the comunidade, which in turn auctioned private owners temporary rights of usage. The comunidade also invested a reported quarter of its earnings into development works lining paddy fields, watercourses, installing sluice gates and planting orchards. Over time, the system has been dismantled. Today, in Goa, the 'modern' institution of local self-governance, the panchayat, has been created in every village, which now exists in addition to the comunidade. The bulk of the land is under private ownership. Jagdish Nazareth, a Goan, writes in the book Fish Curry and Rice, "even today, 232 village comunidades own 30,000 ha of land--8 per cent of Goa's land mass." The issue is about their rights. The code grants them absolute rights over the land. But now that things have changed, what remains? Many comunidade land scams are reported. A similar case is festering with the sale of land owned by the church--a large and wealthy land-owner (see box Land is holy). Language and its interpretation makes life more difficult. "The present code is still in Portuguese. However, an unauthenticated so-called English translation is being circulated by some persons and the same copy is also circulated by the state government's revenue department. The state has made use of the same illegal English version to carry out amendments," says Andre Pereira, an advocate as well as the secretary of the Association of Components of Comunidade. Whatever the language, the land comunidades hold is valuable. Developers want a slice of it. With the institution in decline (or dead, as many say), who will take the decisions to sell or not to sell? Goa is a tourist paradise. But tourists need more than just sun and sand. In its defence of the Regional Plan, the government says, "Goa's economy was initially based on mining. Post-liberation, tourism picked up. But tourism is a fluctuating industry. To get tourists, you need infrastructure. Do we have enough resources for tourists?" The World Tourism Organisation (wto) forecasts that in 2010, about 1 billion international tourist will visit countries all over the world, double from 1995. South Asia will remain a small piece of this tourist pie, but within it Goa is looking at big numbers. It is also looking at attracting the desi tourist. 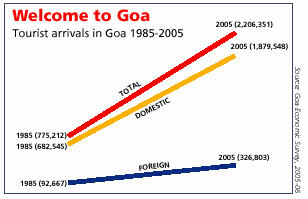 In 2005, the tourist inflow into Goa was twice that in 1998. The bulk of the tourists, roughly 80 per cent, were domestic. Foreign tourists increasingly came by chartered planes--425 chartered flights in 2005-06 (see graph Welcome to Goa).Government says it needs to plan for this development. Strangely enough the state's tourist master plan projects that by 2011 it needs to cater to roughly the same--2.1 million arrivals--for which it plans extensive infrastructure and accommodation development. In 1998, Goa had 30,000 beds. By 2006, the master plan forecasts it will need 40,000. But as tourism inflows have in fact declined in the past two years, it is not clear what capacity upgradation is really wanted. The master plan says it will cost the government Rs 5,724 crore to develop infrastructure. 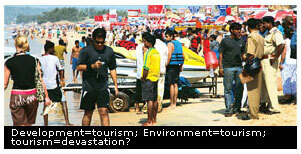 It proposes new tourist centres spread across Goa, and golf courses, a leisure city (in Canacona), resorts and water parks. The government is gung- ho, but Manohar Parrikar, leader of opposition, told Down To Earth, "Tourism will survive but it cannot be the backbone of the economy. Besides, mining is on a decline. Infrastructure is required. We would need nine lakh litres of water per day. Where will it come from?" Tourism is definitely Goa's golden goose. The question is will the goose survive? Goa is a highly urbanised state--the 2001 census found 50 per cent of the population of the state is urbanised, compared to the national 28 per cent. The urbanisation pattern is scattered settlements of varying sizes. In short, urban growth here needs to be approached differently. These settlements are already putting pressure on the state's resources. Water supply and sewage are issues of concern. But garbage takes the cake. For the administration, finding waste disposal sites is a nightmare; villages across the state have closed ranks to say, "not in my backyard." Panaji, the capital, has the worst problem. It has no waste disposal site. Civic trucks often cannot lift garbage from streets. Things often reach flashpoint. Recently, neighbouring villagers filed a police complaint against the town's mayor for 30 truckloads of waste, which the city offloaded near a disputed waste disposal site. The 'garbage' agitates many people, including the non-resident Indians (nris), making their annual pilgrimage home to participate in mega-conventions. At the last meeting, when the state environment minister, Wilfred D'Souza, told the gathering the administration was finding it tough to find disposal sites, an nri Goan said, "How come there is no place for garbage disposal but lots of space for slums? Take out the slums and put the garbage disposal there." Goa's future is clearly shining. 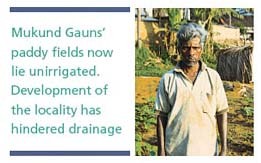 Mukund Gauns who owns about 4 ha of land in Caranzalem in Taleigao, used to grow paddy. "I grow vegetables now, I cannot cultivate paddy anymore because there is no drainage system. Now, I have to buy paddy to eat," Gauns told Down To Earth. N S Dumo, president of Goa Su Raj, a political party, is disturbed about land being usurped without adequate compensation. "Finding alternate means of employment is not easy either," he says. Teleigao, incidentally, is Atanasio Monserrate's constituency. Better known as Babush, he is the former town and country planning minister; he resigned in January, indicted as the man behind regional plan 2011. Local residents told Down To Earth that he forced farmers out of a stretch of land and sold it to builders. A joggers' park is coming up, besides other glitzy developments. Farmers say they have been duped. "The minister came to us personally and asked us to move out. He promised us compensation. 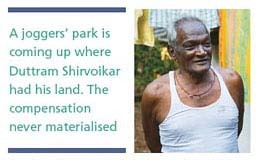 We had to give up our land and we are now suffering," say Duttram Shirvoikar and Nona Shirvoikar, farmers evicted for the jogger's park. Another farmer-family was lucky to get compensation, but a paltry amount. "The minister gave us Rs 20,000 and he had the place sealed with mud. But the money is not enough. Agriculture sustained us much better. Now, we have to make do as labourers," says Bharati Shirvoikar, an affected farmer. Similarly, Mangala Adkonkar from Bambolim says her family had been asked to move out for a range of plush hotels by the Bambolim beach. "Everyone is scared but even then we are not willing to give up our land. Despite living by the sea, we cannot fish anymore. The route to the beach has been barricaded by builders. They come and threaten us showing the gun," she says. But, as a Goan told Down To Earth, it is also important that there are gainers. "The grandsons of toddy tappers and fishermen are running into more money overnight than most elite Indians or Europeans earn in a lifetime." At the same time, work opportunities are shrinking in this literate and highly urban state. No wonder the administration defends its much-hated regional plan, saying it expresses people's aspirations of the 1,400-odd suggestions and objections it received from the public, as many as 1,350 were for change in zones. Many people simply wanted their residential areas, demarcated as agricultural land on plans, be regularised. They had to construct illegal structures, because plans were faulty and not up to date. The problem also is that the law is never equal in the country. Ordinary people find their residences could be deemed illegal. They are often denied the right to put up a small guest house on their crz land or convert a small part of their orchard or agricultural land to build a guesthouse. But they see numerous instances when the rich and powerful were able to use clout and financial power to change their illegal use to legal by applying and obtaining conversion certificates. So, who is planning? For whom? Interestingly, there is near consensus among protagonists and antagonists of the regional plan on the kind of development Goa needs. Industry representative, Datta Damodar Naik, executive committee member of the Goa Chamber of Commerce and Industry, told Down To Earth, "Tourism alone cannot support the state. Goa needs trade, retail, service industry, pharmaceuticals, it, horticulture and fishing. Cities should be planned as garden cities and satellite towns built with integrated transport system. Land estate should be implemented for low and medium cost housing." Yatin Kakodkar, former chairman of cii, Goa Council, concurs, "There is severe water crisis in Goa, besides roads and garbage disposal. The government should first make arrangements for the present population. "The Goa Bachao Andolan feels "development should take place but it must meet the needs of all in the state." The issue is how the planning is done; by whom and for what. The chief town planner has told the court that "in the good old days when a plan had to be prepared, a physical survey had to be carried out." Now, modern technologies can do this work he added. But why were these not used to map land use and identify violators? So, much of the state's problems lie in this ambiguity. Much of the future answers will rest in ensuring the surveys are completed and that the ground-truth is used to establish the basis of future planning and action. But the plan document is not the end. It is the beginning of the process of determining who will plan? And how local and affected people will be consulted in the process? And how they will drive the policy for the future? This is the nub of the Goa problem. The controversy over Regional Plan 2011 will not go away, if this is not recognised and changed. This is when the paradise will not go under the hammer.